The creation of value in tolerant hardwoods starts on the stump. If high quality stems are grown and available for harvest, the forest industry can process them into products that rapidly rise up the value chain. In the value chain, the first transformation of a stem occurs when a felled tree is bucked into logs. Depending upon the operation, this first transformation takes place in the woods, on the landing, or in the mill yard. The successful operator decides which market and grade rule provides the greatest return from the logs a stem can be bucked into. The complexity of the decision—coupled with the speed at which today’s forest operations take place—puts enormous pressure on those bucking tree lengths into logs. Unfortunately once a tree length has been bucked, log value has been established and lost value cannot be regained regardless of a sawmill’s technology. Improper positioning of defects and incorrect log lengths all have the potential to significantly reduce the value of the raw log and hence value recovery for both the logger and the sawmill. 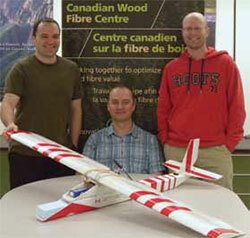 To address this issue FPInnovations and the Canadian Wood Fibre Centre (CWFC) are promoting training using a computer-based tool called Hardwood Buck (HW Buck). HW Buck was originally developed at Michigan Technological University by Professor James Pickens. The HW Buck computer program is a bucking simulator that provides the user with a visual representation of a tree length. All the information required to make bucking decisions is provided in graphical and text format in a classroom setting. Previous studies with HW Buck indicate it is a simple program to become proficient with, and is readily accepted by even the most novice computer user. Its combination of graphic and text information have also been shown to provide a bucker with an accurate representation of tree stems as found in the field, providing a realistic training experience. The way the simulation works is the user first inputs their specifications and price sheet. Training staff provide an overview on log making—and then it is right into the students testing themselves against the computer. Tree lengths are provided and simulated bucking decisions made and compared against the optimum decision. Grade, diameters, sweep, deductions and cull all come into play towards the total dollar value of the student’s decisions. A review of the student’s decisions against the computer is provided and the next test tree length thrown up to repeat the process. Practice makes perfect but true gains are made as the students’ understanding of value creation increases with each simulation. FPInnovations studies have indicated that up to 30 per cent of a hardwood tree’s value is lost during the bucking process. These studies suggest that buckers tend to concentrate on producing top quality logs, while preferring to pulp lower grade material. While the reasons for this trend can be debated, the economic impact of not producing sawlogs out of all acceptable log material is significant for any harvesting operation. Additionally it was noted the tendency to produce longer logs often has significant grade and volume implications for some tree forms, a fact that appears to be not well appreciated by many buckers. The use of HW Buck can help to eliminate lost dollar value by allowing buckers to practice and develop an understanding of how placement of defects, stem diameter, and other tree factors affect the total tree value without physically processing tree stems. Students can quickly put these skills to use when they get back to their real job: creating value by making the right bucking decision. HW Buck represents an effective tool in helping to meet the objective of increasing the value of our tolerant hardwood resource. A HW Buck training session can assist with value creation, but it cannot replace clear and concise log grading rules, follow-up in the field by knowledgeable staff, and regular reminders of log grade standards. The people bucking logs represent one of the first and possibly the most important link in the value supply chain of a hardwood processing mill. While mills make significant capital investment in high tech equipment designed to capture volume and value from delivered logs, one must recognize value lost in making the log can never be regained in the mill. Investing in the people making the logs can reap significant returns and a HW Buck training session is a worthy half-day training investment for any hardwood operation. Peter Hamilton is a Senior Scientist, Harvesting Operations with FPInnovations. Steve D’Eon is a Knowledge Exchange Specialist with the Canadian Wood Fibre Centre. For more information on HW Buck training contact Peter at 514 782-4518 or Steve at 613 732-5595. “Every small, rural county in Alberta right now probably burns on average 1000 tonnes of wood a year, and it costs them money to do it. Larger counties burn much more than this,” says Toso Bozic, Bioenergy Specialist and Agroforester with Alberta Agriculture and Rural Development. However, using wood fibre as fuel to generate heat and/or power takes careful planning to answer questions related to wood quality, cost, availability, processing, transportation, and storage to design a dependable and economical system. Bozic’s job is to help Alberta rural communities and businesses design heat and power generation systems using biomass, which includes producing pre-feasibility studies to answer many of the questions related to wood fibre costs and availability before a dime is spent to install a system. He says the first question potential woody biomass suppliers and bioenergy producers need to ask is who controls the wood source? The second question is how available is it? Examples of potential bioenergy wood sources are private woodlots, forestry companies that typically burn forest slash like tree branches and tops left in the bush, or wood waste accumulating at a sawmill, pallet manufacturer, construction company or municipal landfill. “But I’d like to dispel a myth, which is that there is such a thing as ‘free wood’,” says Bozic. He notes there are always costs associated with negotiating supply contracts, harvesting, gathering, pre-processing and transporting the wood before it can be used as fuel. 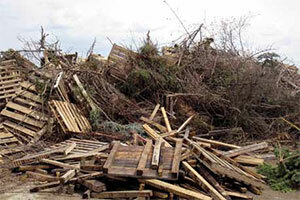 The closest example of ‘free wood’ is wood waste that businesses may be paying to dispose of in landfills. They can justify the investment in a bioenergy system from the savings they gain from not having to pay landfill tipping fees. Another example of close to ‘free wood’ is the large volume of wood waste that municipalities collect in their landfills. Rather than simply burning or burying the waste, it can be used as a fuel source to heat and/or provide power to individual or several community buildings like municipal offices, arenas, community centres, curling rinks, schools, and hospitals. After securing a potential wood supply, it is important to match the type and quality of wood fuel with the appropriate bioenergy system. “You should look at fuel sources first and then at the technology,” says Bozic. Bozic emphasizes that minimizing contaminants within the fuel supply is a critical aspect of all bioenergy systems because metal, rocks, large wood pieces or concrete can do serious damage. The material may have to undergo decontamination at several points along the supply chain before it enters the bioenergy system. In the case of municipalities using woody biomass for community heat and/or power, or even when using it as the energy source of a single building, Bozic says it’s important to have more than one supplier if the material is being supplied on a contract basis. This is to ensure that there is a dependable and consistent fuel supply to guard against potential fuel flow interruptions. Once the supply and energy system have been matched, the logistics of transportation and storage are important considerations. Bioenergy system users must consider whether there is a dependable woody biomass supply within a reasonable distance from the energy plant. Because of the lightweight, bulky nature of processed biofuel, end users should also consider whether it makes more sense to transport processed material, or to maximize payloads by processing the material at or near the bioenergy system. Secondly, it is important to match the transportation system with the storage facility. The storage system should not only be designed to hold the recommended amount of fuel in reserve for the energy system, but it should be convenient to transfer potentially lightweight, bulky material from trucks to the storage system and from the storage system to the energy plant. Bozic says it is not particularly challenging to convert an existing boiler system from using fossil fuels like natural gas to woody biomass. He suggests that businesses or municipalities may want to consider a dual energy system. For more information about investigating the feasibility of a biomass-based heating and/or power system for your Alberta municipality or business and to apply for financial support to conduct a pre-feasibility study, contact Toso Bozic at toso.bozic@gov.ab.ca. The Canadian forest industry wants builders to consider using more wood such as dimensional lumber and heavy structural timbers in mid-rise and non-residential building construction as an alternative to, or in combination with, concrete and steel. And a major obstacle to using more wood in this application may soon be removed. That is according to Dr. Ying Hei Chui, Scientific Director of a strategic research network called the Network for Engineered Wood-based Building Systems (NEWBuildS). Chui said that the National Building Code of Canada (NBCC) is considering making changes within the ‘combustible construction’ section that will allow for an increase in the height of all-wood and wood/hybrid, multi-storey buildings from four to six storeys. He made the comments during his presentation on ‘The Re-Emergence of Multi-Storey Wood Buildings” at the recent Modular and Off-site Construction Summit in Edmonton. The event was sponsored in part by Alberta Innovates Bio-Solutions (AI Bio), which has an increasing interest in green building systems. “There’s no reason why we can’t raise our storey limit to more than four,” Chui said. A primary goal of NEWBuildS is to develop the technical information to support the move towards taller wood buildings. AI Bio is also a financial supporter of the work being done at this strategic network, which was established in 2010. University of Alberta researchers are conducting research on the energy efficiency of mid-rise wood frame buildings with funding support from the network. The NBCC does permit all-wood and wood/hybrid mid-rise and non-residential building construction now, but each project is considered on an individual basis, with very detailed and numerous performance validation and regulatory signoffs required. 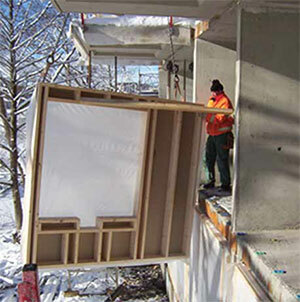 Chui added that this process was used in the design and development of the first modern hybrid timber frame six storey structure constructed in Canada, which was built in Quebec City in 2009. It successfully combines both concrete and structural wood components. A breakthrough in more wood usage in taller buildings also occurred when B.C. recently permitted the construction of light wood frame apartment buildings up to six storeys. Chui pointed out that mid-rise wood frame buildings are not a new concept. A recent survey showed that there are 61, five-to-eight storey, post and beam buildings currently occupied, which were built between 1872 and 1930 in the Greater Toronto Area (GTA). A total of 24 were five storeys or less and 37 were five to eight storeys. These buildings were built before the first publication of the NBCC in 1941 and are still in excellent condition. However, when the NBCC was introduced in 1941, Chui said it limited the height of buildings for this type of construction, particularly when it adopted the concept of combustible versus non-combustible construction. These post and beam buildings in the GTA prove that properly designed and constructed mid-rise wood buildings can perform as well as buildings constructed with other materials. Through detailed scientific research on wood performance as structural components on taller buildings as well as with the introduction of new structural wood products such as cross-laminated timber (CLT), NEWBuildS is helping to make the case for permitting the construction of taller, all-wood and wood/hybrid buildings by the NBCC. More wood use in taller buildings delivers several benefits, Chui said. Concrete and steel buildings account for 50 per cent of the world’s carbon emissions whereas wood is known as a product that stores carbon, taking significantly less energy to manufacture than other building materials. Also, as a building material, it is easy to use and building components can be prefabricated for transport to distant locations or where on-site construction is difficult. Furthermore, because of its lower density, wood works well as a building material for use in components above concrete and steel support structures. 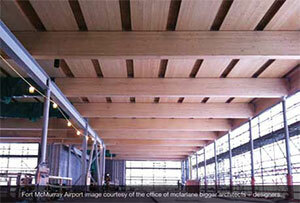 The capacity in Canada to manufacture wooden structural components like CLT is also increasing. Chui said there are currently two CLT manufacturers in Canada with a combined production capacity of 80,000 cubic metres annually. NEWBuildS’s technical expertise consists of 23 university professors and 19 researchers from FPInnovations, the Construction Portfolio of the National Research Council and the Canadian Wood Council. Combined, they supervise about 70 graduate students and post-doctoral fellows from 12 Canadian universities. For more information about NEWBuildS and its research program, visit www.newbuildscanada.ca or contact Dr. Ying Hei Chui at (506) 453-4942 or yhc@unb.ca. 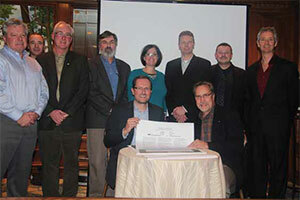 FPInnovations and Ducks Unlimited Canada (DUC) have signed a Memorandum of Understanding (MoU) to promote and support sustainable resource-based industry practices and maintain the function of wetlands and waterfowl resources in the boreal forest. “This partnership is perfectly aligned with FPInnovations’ role as the innovation hub for the forest sector in Canada, its technical expertise in the planning, construction, and maintenance of resource roads, and the Forest Products Association of Canada’s Vision 2020 goal of a further 35 per cent reduction in the industry’s environmental footprint,” said Peter Lister, Vice President, Forest Operations and Wood Products at FPInnovations. The partnership aims to seek opportunities to carry out specific joint research projects, operational trials, and knowledge transfer activities in support of this common objective. “FPInnovations and DUC are committed to working together to support and promote best practices in areas such as road construction in wetlands,” Lister said. With FPInnovations’ engineering excellence in resource roads and DUC’s knowledge of wetlands and waterfowl, this collaboration will contribute significantly to developing new, and promoting existing, industrial practices that maintain the health of boreal wetlands, while supporting and promoting sustainable resource-based industries. There are many planning, construction, and maintenance challenges associated with resource roads in wetland environments. Many resource industries require roads to support their exploration and resource-extraction activities. Improved bearing capacity for the road sub-base and the installation of adequate drainage and water-crossing structures are common challenges. “Our research is aimed at maintaining the biological and hydrologic function of the various types of wetlands, while providing practical cost-effective solutions for the construction of resource roads across wetlands,” said FPInnovations’ Clayton Gillies, Senior Researcher, Resource Roads. “With careful planning, knowledge of various wetlands and associated wetland functions, and the development and use of best management practices for water management, it’s anticipated that both wetlands and resource roads can function as anticipated,” Gillies explained. With considerable technical support from FPInnovations’ Durability and Building Enclosure Group, a developer has obtained a permit from the City of Delta, B.C. to construct the first six-storey building in Canada using wood-infill walls in a concrete column and slab structure. This represents an entirely new market for Canadian lumber. Infill wall on a European construction project (Photo courtesy of European Wood). Wood-infill walls are the general term for the use of wood instead of steel for the exterior walls of high-rises where the structural system consists of concrete columns and slabs. This wall system was developed in the Nordic countries in the 1950s, and by 2003 had captured a 90 per cent market share of the mid- and high-rise concrete residential building market in Sweden. It has since lost some ground due to the use of face-sealed EIFS cladding systems and other cost cutting measures leading to moisture problems. This development is very timely considering the increasing recognition of all-glass high-rises as highly energy inefficient and represents an entirely new market for Canadian lumber. The potential market (100 per cent) in Canada for seven storeys and higher (assuming up to six storeys can be captured by wood platform frame) was estimated by Pablo Crespell of FPInnovations’ Business Analysis Group at about 14 million board feet of lumber and 9 million square feet of sheathing. At October 2012 prices, a 90 per cent market share would be worth about $7.5 million. FPInnovations’ research on the use of non-bearing wood-frame exterior walls (commonly called wood-infill walls) in concrete and steel construction was started a few years ago under the CanadaWood Program with a focus on overseas markets such as China and Korea. The goal was to increase the use of wood in taller residential buildings given that their markets for single-family housing are limited due to high population density. The major advantages of wood-infill walls include improved building envelope thermal insulation, ease of installing cladding and windows, higher construction efficiency resulting from prefabrication, and lower construction costs compared to typical steel-stud infill walls. With considerable technical support from FPInnovations’ Durability and Building Enclosure Group, a developer has obtained a permit from the City of Delta, B.C. 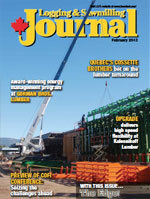 to construct the first six-storey building in Canada using wood-infill walls in a concrete column and slab structure. The Canadian Wood Fibre Centre (CWFC) knows from experience that field tours are an effective way to share information about its research program with the public because for most people, seeing is believing. The CWFC Virtual Tour Development Team (top photo, left to right) Brent Joss, Martin Blank, and Jon Elofson. 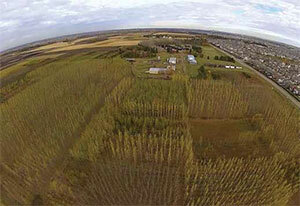 An unmanned aerial vehicle provides a view of CWFC’s Ellerslie research site (below). However, the timing of field tours is not always convenient, and they can be costly to attend and susceptible to poor weather conditions. Virtual field tours delivered over the Internet are something participants can do on their own time, control with the click of a computer mouse—while costing them no money to attend. Participants can also conveniently take part from the comfort of their home or office. “The question for us is how to maintain program visibility and continue to provide participants with that first person experience of being in the field when the resources available to both co-ordinate and attend field tours are limited,” says Brent Joss, Fibre Bio-Geoinformatics Analyst with CWFC. CWFC has combined high resolution digital imaging with the knowledge and interest of staff members in videography and remote control, unmanned aerial vehicles to gather visual information that can be used to develop virtual field tours of its research sites. Joss says developing virtual tours also makes good use of CWFC resources and represents an effective way to disseminate unique visual information to participants. One of the limitations of an actual field tour is that the information presented at ground level typically corresponds to a large area, such as a plantation. Participants literally can’t see the forest for the trees. Consequently, the required perspective may not be available. However, by combining ground views, aerial views taken at various heights, video and still photos with graphs and narration provided by program experts, CWFC believes that its virtual tours will provide participants with comprehensive information and a more unique experience. Also, cameras can be mounted so that they gather footage of how equipment is working to plant, maintain, and harvest, for example, a short rotation woody fibre crop, providing detailed visuals on the mechanical functions of the equipment in a safe manner. The cameras can also be mounted to demonstrate and mimic the equipment operator’s experience. Joss says that CWFC is even working toward 3-D virtual tours so that by wearing 3-D glasses, participants will gain the impression of physically being in the field while taking a virtual tour. With the virtual tour, developers are using video stabilizers to gather video footage so that, for example, when a camera is strapped to a person’s chest as they are walking on unstable ground to gather footage, the result is a smooth video image. The high definition cameras themselves are very durable and are about half the size of a fist, making them easy to mount on a person, on a piece of moving equipment, on top of a telescopic pole, or on the nose of an unmanned aerial vehicle. The telescopic poles being used by tour developers extend as high as 50 feet in the air, providing a unique perspective above the tree canopy. “It provides tour participants with the perspective and environmental context that they wouldn’t otherwise have if they were on the ground,” says Joss. High definition cameras mounted on unmanned aerial vehicles offer an even more expansive view of research sites. “This type of perspective is really useful for assessing and comparing different types of blocks and different plantings, and different types of treatments all in one fell swoop and all in the same frame,” says Joss. “It’s really easy to assess health, diversity, canopy and stand structure, what’s proving to be successful, and what’s maybe not working out as well as we had hoped, because it provides you with the ‘large picture’ and a bird’s eye view.” The unmanned aerial vehicles can gather video footage within a mile radius of the operator’s location. the public as early as this fall. For more information about the CWFC’s development of virtual tours and their future availability, contact Brent Joss at (780) 435-7223 or bjoss@nrcan.gc.ca, or Derek Sidders at (780) 435-7355 or dsidders@nrcan.gc.ca.